Catfish are common freshwater fish that can pack on the weight. They can grow to massive sizes and will eat just about anything you can imagine. Anglers have differing opinions on the best catfishing tips, from the size of tackle to be used, to baits and even hand fishing (noodling) for monsters! 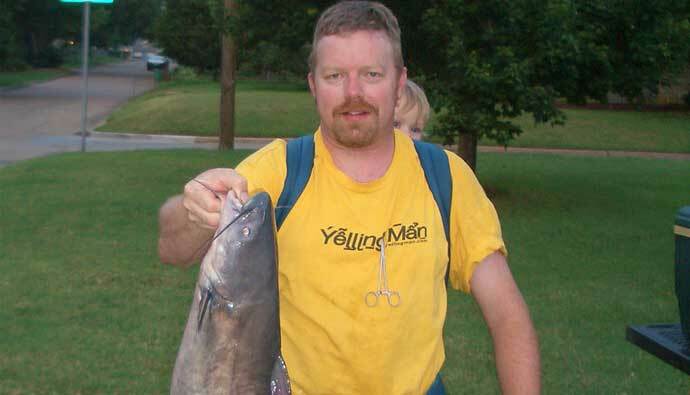 In this article, I am going to cover a few of the must-know catfishing tips. This includes where to find the big ones and what you can do to improve your odds of landing one. And yes! We are going to cover hand fishing for catfish (also known as noodling). Identifying Characteristics Brownish Grey in color with spots along the body. Long “whiskers” on the side of the mouth. Habitat Lower Canada, Eastern/Northern United States, And Northern Mexico. Depth Range 6ft from the bottom of lakes, ponds, and creeks. Fishing Information Catfish are best attracted to “smelly” baits. Size The Channel Catfish reaches around 30 pounds. Other catfish can reach well over 100+lb. Largest Recorded 646 lb Mekong Giant Catfish caught on May 1, 2005, while fishing in Thailand. Catfish are known as bottom feeders. This means they basically hang out on the bottom of creeks and ponds in search of scraps, or anything that falls to the bottom. Catfish are more often raised in farm ponds that either allow you to pay to fish for them or sold already cleaned and ready to cook. For being the vultures of the water, catfish are some of the best-tasting fish. Catfish fillets are popular at grocery stores for home-cooked dinners, as well as, served at restaurants. The farm-raised catfish are fed on a more controlled and “cleaner” diet than those found in creeks, rivers, and ponds. Catfish can grow to massive sizes. A 25-pound catfish is quite common, although they can grow to well over 80 pounds. There are different types of catfish that can be found around the world. The most popular here in the U.S. are blue cats and channel cats. Both of these species of catfish are a good choice when it comes to eating. They both do well in stocked ponds for farm raising. Catfish can be found in just about any body of freshwater. What separates catfish from many other species of fish is that they are a more hardy fish and can survive more harsh conditions. There are actually species of catfish that can survive droughts by burying themselves in the mud until the next rain. Lakes, rivers, and creeks are a good place to find catfish and usually large ones. When fishing in lakes, rivers, and creeks for catfish, always remember to look for the deeper water. Where there is deep water, there are almost always big cats waiting for something to come along for them to eat. When looking at the topography of the specific waterway you’re fishing, look for deep saddles, gulleys, or steep drop-offs. These areas always hold catfish of various size that will almost always lead to a good day of fishing! Also when studying the body of water you plan on fishing in, make sure to look for areas that water flows into the main section of water. Drainage pipes and smaller creeks are great areas to look at these places hold catfish that are looking for a quick meal flowing into the still pools near the inlets. The equipment for Catfishing is fairly simple, due to the fact you will not be casting near as much and are still fishing 99.9% of the times. Spinning reels are a go-to when going after catfish since you don’t need to cast far distances and you want a low chance of tangling. Spinning reels model 4000 and higher are big enough and strong enough to deal with whatever size fish you happen to hook up to! Rods are something that many people will argue about. In my personal experience, medium-heavy and heavy action with slow tips are necessary when targeting catfish. This is due to the sheer size of the fish that are typical in my neck of the woods. As far as length goes with rods, I personally use a 7’2” rod for my main rod. This size is just long enough to give the necessary leverage on the larger cats I encounter at my local lakes! The lines that are recommended are 40 lb Powerpro braided fishing line. Some anglers use bigger lines so that they can bring in the fish no matter the size. This Powerpro braid It is strong enough to horse in the normal sized cats but weak enough to give a little more fun when you hook up on a giant fish! The hooks that most anglers and myself included use are 4/0 circle hooks, the thicker the gauge wire used in the hooks the better. When using a circle hook all you have to do is simply start reeling in when the fish has the bait and the hook will be in the corner of the fish’s mouth. There are tons of other bait specific hooks you can use such as treble hooks with sponges or mesh around the shank of the hook. These hold dip bait and keeps the bait there to aid in simplicity for fishing. The baits to use for catfish range greatly but there are two main types people use. The first is chicken liver, which works great for catfishing, it is bloody, sticky, and stinky. When in doubt, use the trusty hot dog catfish bait. The main thing that’s wrong with using chicken liver is the fact that if you cast too hard your liver will fly off the hook. Especially if you buy chicken liver instead of rooster liver. Rooster liver is tougher and stays on the hook better than the livers derived from hens. Cut bait is another absolutely great bait to use for catfishing in which it will always catch something. Once you catch the baitfish, you need to dispatch them. As grotesque as it sounds, a sharp quick throw on a rock or the ground will dispatch them quickly and cleanly. After the fish has been dispatched, all you need to do is cut the bait into smaller pieces and thread onto a hook and you are good to go! The last and final piece of equipment that is necessary for catfishing are your weights. Anything ½ oz and higher will do you perfectly, some people use smaller weights but when doing that the current in the water tends to make the bait drift. The method for fishing catfish is pretty simple. Throw out your bait and “wait”. This has been a long proven process. Since catfish are opportunistic feeders, they rely greatly on smell such as that from rotting fish, for example, to find a meal. It is also for this reason that the “smellier” your bait is, the better luck you will have at catching catfish. (And a few turtles along the way). There are basically two ways to fish for catfish. One is the bobber method. This is where you attach a bobber about a foot up from your hook. This will depend on the depth of water you are fishing, and wait until you see the bobber go completely under. This usually means the hook is already set. The other method is “bottom fishing”. This is where you throw your bait out and let it set on the bottom of the pond, creek, etc and wait for the line to tighten. Reel in until the line is tight then pull up quickly to set the hook. Repeat again if the species you’re going for has a hard mouth or are large. 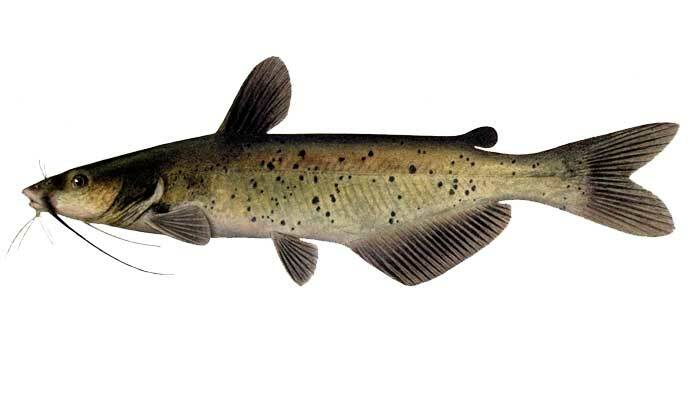 Some catfish have very sharp fins on each side of their body, just behind their head. These fins can do some major damage to an unsuspecting fisherman. 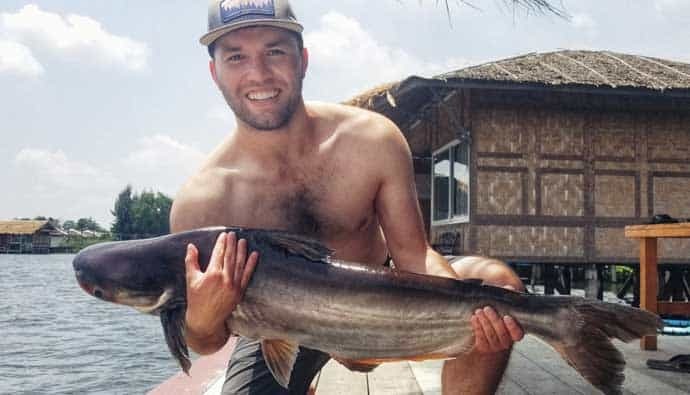 Here’s Jon with his Striped Catfish he caught in Thailand using a circle hook, bobber, and bread. If you’re holding the catfish barehanded, then be careful of these fins while unhooking a catfish. You can also pick up some puncture resistant kevlar gloves if you want an added layer of protection. When taking out the hook from the mouth, use fish lip grippers to keep the fish under control and use your spare hand to remove the hook. If you don’t have one, then you can keep the catfish on the ground while you use pliers to unhook it. There actually is a third method that is quite common in the South yet not for the faint of heart. This method is called noodling. No, this is not fishing for catfish using pasta. It is a method of hand fishing. This is where being an angler and a daredevil come together. In noodling, you are in the water exploring holes in the banks along the water, searching for catfish. The method itself involves sticking your hand into these dark holes and seeing if a resident catfish bites down on your hand. If it does, you grab the fish and wrestle it out of the hole. The thing to keep in mind when using this method is, there are other creatures that call these holes home. These include. snakes, snapping turtles, beavers and the list goes on. If you have always wanted to land a monster fish but are unable to go saltwater fishing, catfishing is the next best thing. 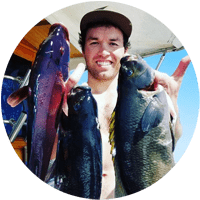 These fish grow to enormous sizes, they are relatively easy to attract and catch, and in my opinion, some of the best-eating fish. Areas to go catfishing are also relatively easy to find. They are one of the most common ponds raised fish. Finding a good “catfishing pond” should not be too difficult. Also, local rivers and lakes are a good place to find catfish and usually some pretty large ones. We hope this article has been helpful and inspires you to go out and catch a “mess of catfish”. A: Yes, They do bite however, they do not have spike-like teeth so the teeth are more like high grit sandpaper. A: While catfish can be caught at any time of the day, we have found some of the best catfishing to be at night. This is also when we have caught some of our largest. Q: Are catfish common to all areas. A: Catfish can be found all over the world. They do range in size and color, however. 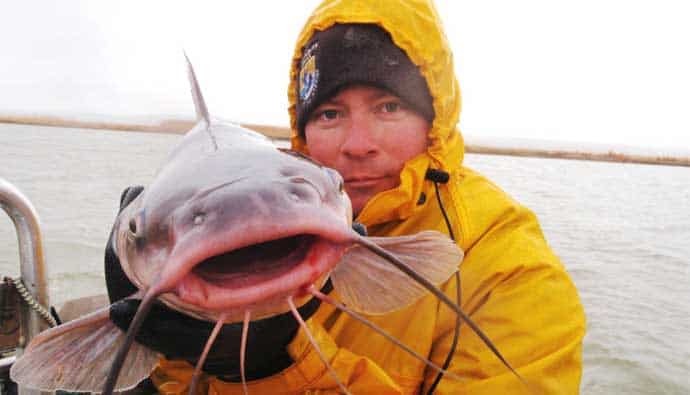 Q: Why are they called “catfish”?